The 8 Ultimate Business Card Mistakes to Avoid! If this is your first time designing a business card then you’re bound to be a little apprehensive. We’ve all had the niggling thoughts such as; What goes where? Does my business card stand out? Will my business card fit with my brand? These are the most common worries that go along with making that very first impression. 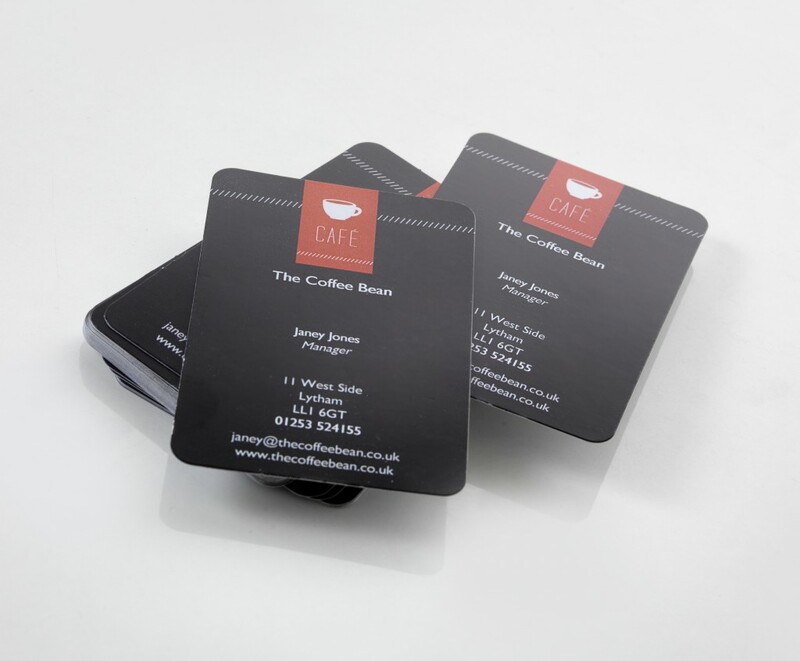 At 123print UK we’ve had many years experience with business cards and we like to think we know a thing or two about how to design them! So, to make things a little bit easier, we thought we’d list our 8 ultimate business card mistakes to give you a head start when designing your business cards; the official number 1 direct marketing tool. If you’re industry is highly competitive and your business card is one of your number one marketing tools, then it will be no surprise that your competitors may very well be competing in the same way. With this in mind, it’s important that we remove the chance of uncertainty with business cards. For example, if you pick up a business card and the information is not labelled correctly, or there is a discrepancy between which is your fax number and which is your phone number, then I may very well choose to phone a competitor. Tip: Make sure you label essential contact information clearly and in the correct industry accepted format. Avoid creating confusion with the content on your cards so that it’s clear and concise. As well as labelling your information correctly, it is imperative that you think carefully about what phone numbers you want to include on your business card. If you’re a busy bee and find yourself away from the office or at home for most of your working life, then it may be important to include mobile numbers. Alternatively, people who place a higher level of privacy on their home life may want to avoid listing home phone numbers or private mobile numbers. Everyone needs a break from the hustle and bustle of work, and you don’t want to feel pressured into speaking to clients 24 hours a day! Tip: Choose your phone numbers wisely to ensure that you’re available in the right ways and at the right times. Be careful that it doesn’t encroach on your personal life and become a nuisance with unwanted out-of-hours calls. When you pick up a business card, after the logo and design, the first thing we tend to notice is the contact information. Having a small font can often be distracting from the overall design of the card and can come off quite tattered as it lowers the integrity. Moreover choosing a small font can be quite hard to read as they can become easily blurred, giving an overall disreputable appearance. Tip: Choose a suitable font size that will be legible once printed and that compliments the overall design of your business card. While the font size is important, it’s even more paramount to choose a legible, clear font that stands out and delivers your message. 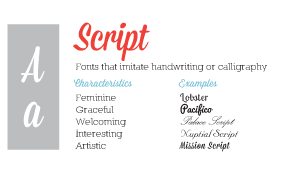 Refrain from opting for script fonts which have a particular flair, and handwriting effects as they can be especially hard to read when printed. Tip: Opt for clean and crisp fonts for to detail your key information, as you don’t want critical details being missed due to an out of placed flick. 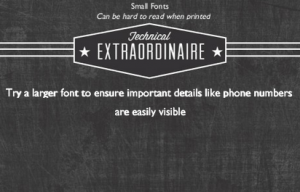 To adhere with best-practice design standards and techniques, the maximum number of fonts you should be using on your business card is two. Even then you should only use contrasting fonts if they apply to brand guidelines or are differentiated by front and reverse designs. Any more than two and important information starts to become confusing, general design starts to become tatty and the overall message becomes clouded. 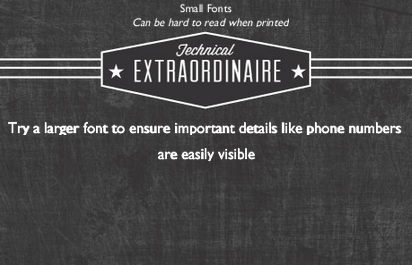 Tip: Stick with a distinct, clear, correctly sized and simple font style. 6. TMI – Too Much Information! Ensuring that potential clients can contact you is essential! Of course you’ll want to get people looking at your services on your brand new website or joining in the conversation on Twitter, but there’s no need to fill every blank space with a QR code, Twitter tag and Website URL. Tip: Be moderate with your information and keep it classy rather than desperate. Just like this blog post! When you’re handing out a business card at an industry event or in a face-to-face scenario, then the recipient will be really wanting to contact YOU! A generic, branded email address such as sales@123print.co.uk or info@123print.co.uk will leave people unclear and untrusting as to who will be replying and whether their needs will be fully understood. After all, it’s you who they’ve spoken to, met with, and want to contact. Tip: Keep your business card as a personal exchange of good faith by including your personal manned email address (even if it does go through a secretary first). I’m sure you’ve seen the cheap, cheap, cheap business cards available from some scrupulous printing companies in exchange for your key contact information. 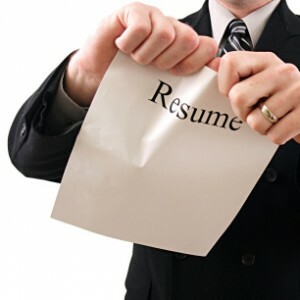 However, one of the worst impressions you can give a potential client is that you are both cheap and unprofessional. You’re not networking to advertise someone else, but to impress with yourself and your brand. Tip: Business cards are not overly expensive and you pay for the quality; so give the right impression and avoid including the printing company’s branding on poor quality cards. Do you have a tip that could help others when designing business cards? Let us know below, or show us on our Facebook page! If you’ve been paying any attention at all to developments over the last few years, you’ll already be well aware that times have been tough for a lot of people. Since the onset of the global financial crisis in 2008, economies across the world have been mired in slump. While there have been some signs of a revival – albeit a tentative one – in recent months, the medium to long-term outlook remains unclear as yet. As a result of the crisis, unemployment has been particularly high across Europe and youth unemployment has soared to truly dire levels in many countries. Given the general economic outlook, then, you might think that now isn’t the most opportune time to become your own boss and start a business. However, this is precisely what many people have been doing, in many cases out of necessity and a lack of alternative options. Many young people in particular have tried their hand at entrepreneurship – although others have become more risk averse and less willing to gamble as a result of the economic upheaval of recent years. If you’ve always fancied the idea of becoming your own boss, then in spite of everything you could well make a go of it, even now. However, there’s a lot you need to think very carefully about before you take the plunge. If you have a mortgage to pay and a family to support, for instance, then you owe it to them to be cautious before doing anything which could potentially have serious downsides. It’s worth looking at the example set by successful entrepreneurs, taking note of what they’ve done right but also what they’ve done wrong. Here are some guidelines to set you on the path to a successful stint in business. There’s no question that the prospect of starting a new business from scratch can be an intimidating one, particularly for those who’ve never had any experience of doing so in the past. If you’re serious about becoming an entrepreneur, however, then you really can’t afford to let that put you off. Above all, you need to know what you’re looking to achieve and what’s likely to set your offering apart from the rest of the crowd. Not everyone is cut out for entrepreneurship, and it’s better to be honest with yourself about whether this is really the right path for you to travel along before you commit yourself to anything you later find you can’t deliver. An article from Entrepreneur.com offers a number of useful tips in this regard. It stresses, above all, the importance of self-belief – if you really have your heart set on entrepreneurship, then it’s ultimately up to you to make it happen. Once you take that decision to start your own business, you have to make sure that you stick to it. However tempting it might be to make excuses later on – whether blaming the state of the economy, or blaming those closest to you – you need to be aware that this won’t help you make a success of your business. In this sense, you have to be hard-headed no matter what’s thrown at you. You also have to have a clear idea of what you want your business to offer before you do anything else. Blundering into business is hardly the best way of ensuring future success. Think about what you’re most familiar with, and look closely at what your would-be rivals are doing. If you see an example you’re particularly impressed by, then seek to emulate its successes and avoid its mistakes. It helps if you can identify a gap in the market, as the more crowded a particular market is, the harder it’s likely to be to establish a successful business. Crucially, you need to know just who you’re pitching your goods and services at. This is where thorough market research is likely to be absolutely key to the success of your business. You need to be reasonably confident that your nascent business will have a steady flow of customers, otherwise you’ll really be taking a leap into the dark. Don’t just assume you’ll be besieged by customers, because you won’t unless you make that happen. So you’ve got your business up and running, and you’ve had some modest early success. What, then, do you do next to sustain that early momentum? Another Entrepreneur.com article offers some tips. Thorough planning, in particular, can be the difference between success and failure. It doesn’t have to be a particularly weighty tome – just a few pages on your objectives, strategy and finances should suffice – but having all that written down could be crucial. However, you shouldn’t be afraid to revise and alter your plan when circumstances demand it. You should also be open to suggestions from others. It’s one thing to be determined and single-minded, but you shouldn’t let your ego get in the way. Sometimes feedback and suggestions from others can help you see things in an entirely new way. By the same token, you should be prepared to delegate tasks to colleagues where appropriate. Many would-be entrepreneurs are tempted to do absolutely everything themselves, but this can soon start to get overwhelming. Capable colleagues are a valuable resource, so make use of them. It’s also essential that you have a good grasp of the numbers, as this can help you make the right decisions at the right time. As an entrepreneur you need to know just what your finances are at any given time, so you can adapt your strategy accordingly. This flexibility is crucial for anyone trying to carve out a successful career for themselves in business – so don’t be afraid to make changes as and when you feel the need to do so. The internet is a valuable resource and can help you keep in touch with all the latest developments in the world of business, so make use of it. It can also enable you to build up stronger relationships with your customers. How do successful entrepreneurs prosper? Entrepreneurs are often presented in the media as possessing near-superhuman qualities which enable to bestride the globe like some sort of colossus. The reality, however, is somewhat different – although foresight and hard graft are essential, there’s also a degree of luck required to become a successful entrepreneur. To an extent, it’s a case of being in the right place at the right time and with the right product or service to offer. It’s worth looking closely at individual case studies to see what entrepreneurs themselves have to say about how they got to where they are. Speaking to the BBC, Innocent Drinks founder Richard Reed explained that building a strong team can provide aspiring entrepreneurs with a crucial head start. He suggested that entrepreneurs are very rarely all-rounders – some may be more adept financially than creatively and vice versa, for instance – so it helps to have capable colleagues on hand to provide valuable input. He also pointed out that while the risks of setting up a business are considerable, the rewards can be much greater. Running your own business not only enables you to learn skills you otherwise wouldn’t have needed, but it also gives you the opportunity to meet fascinating new people. However, Reed warned against taking excessive risks and suggested that would-be entrepreneurs should take care not to expose their family life to unnecessary dangers. Perhaps the most interesting observation Reed makes in the BBC piece is that there opportunities in times of economic slump as well as during the boom. Given the continued economic uncertainty, it may be tempting to procrastinate over the idea of starting a business – but being an entrepreneur in the truest sense of the word involves taking some risks in time of adversity. Nevertheless, it may be prudent to have a backup plan in place, just in case. There’s been much debate over just what it is that constitutes a truly entrepreneurial mindset, and it’s probably true that successful businesspeople do share a number of qualities in common. That’s not to say that entrepreneurs are a homogeneous bloc, of course, but there are certain entrepreneurial characteristics which crop up time and time again. 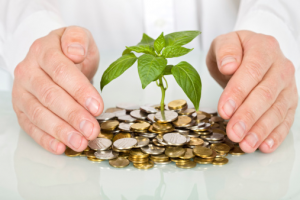 According to Ivey Business Journal, no aspiring entrepreneur should expect instant returns. The process of building up a business from scratch is frequently slow and frustrating. It should go without saying, then, that having a degree of patience is likely to stand a businessperson in good stead. However, it’s particularly important to put the hard yards in during the early days of any new business, as around half of start-ups fail within five years. The ability to make difficult choices also sets the entrepreneur apart from the crowd. Running a business places many demands on the business person’s time, finances and energy – entrepreneurs are therefore likely to find that they simply won’t be physically or financially able to do absolutely everything they’d like. Entrepreneurs are also likely to be faced with obstacles along the route to success, and possessing the flexibility to meet these challenges successfully when they arise is also a central attribute of the successful entrepreneur. Another Entrepreneur.com article also lists a number of attributes likely to serve aspiring entrepreneurs well. It stresses the importance of doing something you genuinely enjoy – some people enjoy hard work in itself, but it helps to build a business in an area you have a real passion for. If you aren’t totally enthused by whatever it is you’re doing, the chances are that this will manifest itself in the performance of your business – and it’s therefore probably less likely to succeed. Self-promotion is also an important aspect of entrepreneurship. It’s not enough to just assume that if you build a business, customers will come – this is unlikely to be the case. Your competitors will be putting themselves out there at every opportunity, and so it’s incumbent upon you to do the same. There’s a fine line between being an effective self-promoter and simply being obnoxious, so great care should be taken to avoid falling into the latter category. By the same token, being personable can provide ambitious entrepreneurs with an important advantage. The dedicated entrepreneur makes the effort to get to know their customers, providing them with attention over and above what they would normally expect. Customers appreciate this kind of effort, and are likely to reward it with their continued custom. This repeat custom will provide your business with a crucial base to build on. Your customers are the lifeblood of your business – they are genuinely indispensable – and it can’t be stressed enough that catering to their needs could be the key to long-term success. With an economy that seems to be tightening its belt at every quarter, more competitors throwing their hats into your niche and people flocking in droves from high street to online shopping; it would seem that for small UK businesses networking is becoming an essential part of daily life. Gone are the days when networking only applied to the more egotistical entrepreneur! Today every small business owner has to understand the rules of networking and the potential clientèle and sales that every meeting can promise to produce. With suggestions from our Twitter and Facebook page we decided to make a little info graphic listing the top tips from our very own fans. Enjoy! 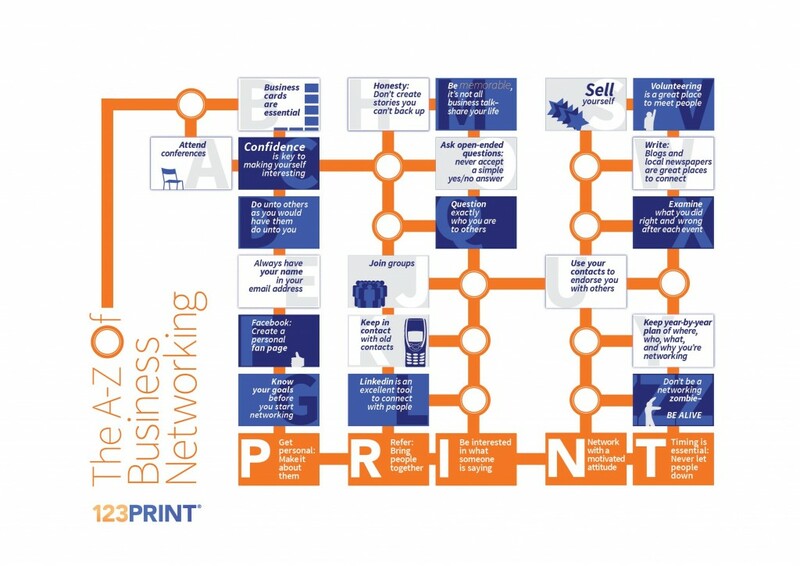 The “A-Z of Business Networking” infographic was designed by 123Print UK, We make printing business cards, address labels, postcards etc. affordable, fun, and easy. Straightforward pricing with no tricks. We’re on your side!Do you have any of your own tips for networking? Share them below or post on our Facebook page! You might not think that, given the current economic uncertainty, now would be the most opportune time to start your own business. However, provided you have a solid business plan and are prepared to persevere, you could well prosper if you take the leap and try to build a small business of your own. Of course there are risks involved – this is always the case, no matter how healthy the wider economy is – and much careful forethought and consideration is required beforehand. Nevertheless, building a small firm up from scratch can be as rewarding as it is challenging. Indeed, at a time when good jobs are so few and far between, perhaps you could reap the rewards from taking that risk. It’s often said that those who dare, win – and there are certainly plenty of successful small businesspeople who can testify to that. Whether you’re a recent graduate who’s grown frustrated by the graduate jobs market or you find yourself stuck in a rut and want to break out of your current career trajectory, starting a small business could be the ideal option for you. Obviously, you need to know just what market you’re planning to target and you also need to think carefully about what your rivals are doing so you can steal a march on them. If you’re tempted by the idea of starting your own small business, here are a few suggestions you may wish to bear in mind. There’s been much talk about how challenging the graduate jobs market is. Indeed, good graduate jobs have come at a premium ever since the global financial crisis first struck in 2008. It should go without saying that this has caused much frustration among graduates eager to take that first step on the career ladder. Many graduates plug away for months or perhaps even longer in search of that all-important first post-uni job – many, of course, end up stuck in apprenticeships (often unpaid) and still others get sidetracked in jobs which have no relation to the career they really want to pursue. With all that in mind, then, maybe becoming your own boss could be just the right move for you. A useful article from Studential.com offers some tips for those graduates pondering the possibility of setting up their own small business. First and foremost, you can’t – or you shouldn’t, at any rate – go into business without a solid business plan behind you. You really need to know what you’re looking to achieve with your business, and how you intend to reach your chosen goals. There’s always the temptation to plunge right in, but it’s best to be analytical. This should enable you to build a platform for lasting success. This isn’t just true of graduates looking to establish startups, of course, but it’s also crucial for all would-be entrepreneurs. Furthermore, it’s essential that you’re aware of your own limitations as a graduate businessperson. The biggest problem you’re likely to face, at least to begin with, is your own lack of experience. However much business acumen you think you’ve got, it helps to be able to tap into someone else’s experience while you’re finding your feet. This is where a mentor could come in very useful. Having another businessperson on hand to guide you through the early stages of establishing your business could prove crucial further down the line. Don’t just assume you already know everything there is to know – this is likely to prove a fatal error for your business. When starting out in business, it’s best to start slowly, so don’t get ahead of yourself. You need to carry out thorough research into your target market, and find out how you can differentiate yourself from your competitors. There’s more to this than just doing a quick Google search – it really does take effort and diligence. 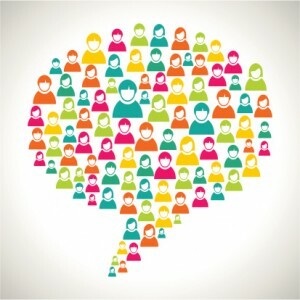 Social media offer new startups an opportunity to connect with potential customers, but there’s really no substitute for talking to people face to face. Perhaps the most important thing to remember, though, is that it’s really best to do something which genuinely interests you. That way, at least it’ll be easier to motivate yourself to keep persevering through all the challenges you’re likely to encounter. If you’re fed up in your current job and you fancy a change of scene, then perhaps starting your own business could provide you with a new sense of purpose and give you somewhere to really channel your energies. Much of what we discussed in the previous section will apply to those of you thinking of establishing a startup as part of a career change – you’ll need to do something that interests you, carry out thorough research beforehand, and remain aware of your limitations – but unlike most young graduates, you probably have other things to worry about as well. Maybe you have a mortgage to pay off, or a family to think about. This does complicate matters somewhat, but it doesn’t mean these barriers are in any way insurmountable. An article from About.com offers some tips for those considering starting up their own business. Firstly, you need to be willing to take risks if you’re to make your small business succeed. This might sound like an obvious statement, but you’d be surprised just how many people fail to appreciate just how much risk is involved with starting up a new business from scratch. You should also make sure that you’re honest with those closest to you about just what you’re getting involved in. Don’t try to pull the wool over their eyes, because they’ll only resent you for it later on if things don’t work out as anticipated. Some people are unwilling to walk away from their job altogether to concentrate on building a new business up, of course. This is understandable, and if you don’t feel you can commit fully to your fledgling business then maybe it might be best to put the idea on the backburner until such time as you feel confident enough to take the plunge. However, if you do start a new business and you find your finances are stretched, it might be worth considering taking a second job – maybe a part-time one – or doing some freelance work on the side. This should at least help to ensure that the money keeps coming in while you put in the hard graft to ensure your business’ foundations are secure. When you first get it into your head that you want to set up your own business, there’s always the temptation to just rush out and plough straight into it. However, if you set up a business in haste, then you’re likely to find yourself repenting at leisure later on – so it’s well worth taking a step back and thinking about just what you want your business to achieve, and when. 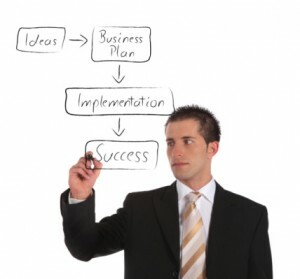 This is where a coherent business plan is likely to come in very handy. A business plan can lay the foundations for your small business, giving you something solid to build on. However, there’s much to consider when drawing up your business plan, so here are some suggestions. As this BBC article observes, your business plan needs to encapsulate your firm’s strategic, financial and operational aims. You need to include details of the products or services your business is going to offer, an initial executive summary and a written overview of your goals for your business, financial forecasts and information about the makeup of its management team. You need to think carefully about what you really want for your business before you get straight into writing up a business plan. Think about what your ambitions are – do you want rapid expansion or are you content to maintain a steadier pace of growth? Consider how you intend to differentiate your business from its rivals, and include that in your business plan. It’s also a good idea to include some basic market research in your business plan, so look at what your potential rivals are doing and think about how you can better it. You also need to discuss your marketing strategy, and how your products are going to be priced. No new business is going to get anywhere without having the right finance behind it, so you’ll also need to include financial forecasts and use these to determine how much money your firm will require. You should also include a sales forecast, cashflow forecast and projected profit and loss account for up to five years into the future. When you’re drawing these forecasts up, it’s best to err on the side of caution – don’t succumb to the temptation of over-optimism – and make sure you get a qualified accountant involved in helping you to prepare them. An article from the Guardian, meanwhile, also offers some more tips for those getting ready to draw a business plan up. It stresses the importance of thorough market research, and suggests really thinking carefully about what your business is going to offer that its rivals can’t. Consider where there’s a gap in the market which your business can occupy, and how it’s going to do so. Of course, even if you do see a gap in a particular market, that doesn’t necessarily signify a golden opportunity – it may be that others have tried and failed to make that territory their own. It may be that there isn’t a great deal of money in a certain sector in a particular area, of course. You should look at why previous firms have failed, so you can avoid falling into the same pitfalls as they did. In addition, you should also be prepared to go back to your business plan every so often and revise it as and when you need to. Your business plan needn’t be set in stone – in fact, it shouldn’t be. It’s best to reconsider as and when your circumstances change or the market changes, so that you can adapt your own strategy accordingly. This kind of flexibility and willingness to adapt could prove crucial in ensuring your firm’s long-term success. No matter what market you go into, the chances are that there are countless businesses which have gone before you – and many if not most of these firms will have crashed and burned. It’s up to you, therefore, to ensure that your own firm doesn’t go the same way as its less successful predecessors. Again, this is where thorough research is likely to prove crucial to the prospects of your business. Whether you’re a total beginner or you’ve had some experience of running businesses in the past, you need to take great care before entering into each new venture if you’re to stand a realistic chance of making it a success. Writing for the Publicbeta blog, Mohit Pawar reflects on his own experiences as a businessman, and offers advice to those looking to avoid making the same mistakes he did in the past. In particular, he stresses the importance of putting in the hard work – some people have a tendency to fall in love with the idea of being an entrepreneur to such an extent that they have an inflated view of their business and neglect some of the basic fundamentals. Unless you’re prepared to put your energies wholeheartedly into making your business a success, you will most likely be running the risk of failure. It’s also worth having a backup plan just in case. This way, if your original plan for building your business up hits an unexpected snag, you can take an alternative approach and see how this works out for you. Don’t become reliant on a small number of key clients – look to make new contacts continually and branch out. Complacency has been the downfall of countless small business over the years, and it’s a trap you most definitely need to avoid falling into. You should also be very wary of getting stuck in your comfort zone. It may be that you’ve opted to start a new business as part of an effort to get out of your previous rut – so, presumably, the last thing you want is to find yourself stuck in a new one as a businessperson. It’s also very important to make sure that you don’t get ahead of yourself. Some people take to running a business like a duck to water, but that doesn’t mean they’re guaranteed continued success. Take small steps – of course excessive hesitancy is best avoided, but a degree of caution is advisable. You could have the greatest small business in your field, but that’s unlikely to do you too many favours unless it has an adequate marketing operation behind it. It’s absolutely essential that you really put your business out there, and make sure that any potential customers know what you have to offer and where they can find you. It’s your responsibility as a businessperson to make the case to potential customers as to why they should give their custom to your firm rather than a competitor. An article from Startupnation.com offers a number of tips in this regard. 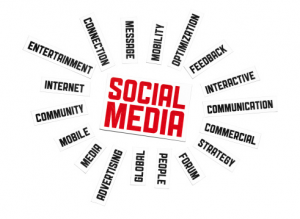 It points out that start-up businesses should make the effort to reach out to customers via social media. Given the sheer number of people who regularly use social networking sites such as Twitter and Facebook, it would be foolish not to take advantage of what these resources can offer your business. Indeed, consumers have largely come to expect to be able to interact with their favourite businesses and brands via social media, and you need to ensure your business is responsive to this demand. It helps to know, also, just what your firm’s strengths are and how you can play to them. This can, in turn, help you market your business more effectively to potential customers. Consider what differentiates your business from its competitors, and emphasise these factors in your marketing. Think about how your customers can benefit from what you have to offer, and why they should opt for your business rather than any of its rivals. Having said that, a degree of cooperation with other small firms in your field could serve your business well in the long run – you needn’t be at one another’s throats all the time, after all. If there are ways in which you can work alongside other companies in your area of expertise, then don’t be afraid to pursue them. You might be surprised at how receptive your putative competitors are to this kind of approach. So you’ve got your business set up and your marketing tactics in place. But just how do you work out when your business is doing well? Naturally, the bottom line usually gives aspiring entrepreneurs a reliable indication, but that’s not all there is to it. An Openforum.com article notes that it can be confusing when you’re running a small business to work out just how your plan is proceeding. There are however a number of ways in which you can ascertain how successful your firm has been, and not all of them revolve around finance. 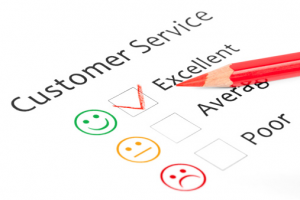 Customer feedback is crucial for any business, so it’s important to seek the opinions of the people who buy your products and services. This way, you can work out just what they make of the standard of service they’ve received or the quality of the products they’ve bought from you. You can then tweak your offering accordingly if you feel the criticisms you’ve received have some grounding in reality. If customers are coming back to you and reporting that your services of products have made a positive difference to their lives, then this is a surefire sign that you’re moving in the right direction – as well as being one of the most rewarding things about running your own business. Even seemingly minor things like seeing your business crop up on the first page of an internet search can give you some idea of how much progress your business has made. When customers or clients come to your business from further afield, it’s likely to be a reliable sign that your business is moving in the right direction and that positive word-of-mouth discussion is being generated. Customers who are happy with services or products are likely to recommend the businesses they’ve received them from to friends and family. This can be very important for new businesses. When you find for the first time that certain regular customers are coming back to your business time and time again, you can probably deduce from this that your firm is doing something right. You may also find that local media have started to pick up on your business, and provide it with useful coverage and publicity. These are all indications that your firm is on the right track. That doesn’t mean you can afford to get complacent, of course, but it should give you that encouragement you need to continue to build and expand your business.